After its redesign for 2019, the Volkswagen Jetta is now in its seventh generation. The 2019 Nissan Sentra is another competitor in the sedan segment that’s also in its seventh generation. 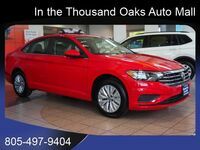 Naturally, many drivers find themselves having to choose between the 2019 Volkswagen Jetta vs the 2019 Nissan Sentra when shopping for a new vehicle. We’ve highlighted both sedans’ engine performance, fuel economy and technology to help you decide. Comparing engine performance between the two sedans reveals that the 2019 Jetta edges out the 2019 Sentra. 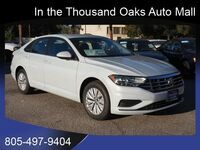 The 2019 Volkswagen Jetta is powered by a turbocharged, 1.4-liter, four-cylinder engine with 147 horsepower and 184 pound-feet of torque. In comparison, the standard 2019 Nissan Sentra’s standard engine is a 1.8-liter, four-cylinder engine that produces only 130 horsepower and 128 pound-feet of torque. Engine performance isn’t the only factor to take into consideration when buying a new sedan. The amount of available interior features can make or break a vehicle for many drivers. While both sedans offer plenty of features, certain technology features that are only available as optional equipment for the 2019 Sentra come standard in the 2019 Jetta. One notable example is Apple CarPlay and Android Auto smartphone integration, which is standard for the 2019 Jetta but optional for the 2019 Sentra. 2019 Volkswagen Jetta safety features include: Brake drying, traction control, auto delay off headlamps, rear door child safety locks, tire pressure monitoring, dusk sensing headlamps, daytime running lights, a post-collision safety system, child seat anchors, LED headlamps, stability control, front and rear head airbags and passenger airbag occupant sensing deactivation.